​Is the state of our educational system a big problem for our industry? Ed and Bill debate the cogs that drive educational opportunities for students, retailers and manufacturers. 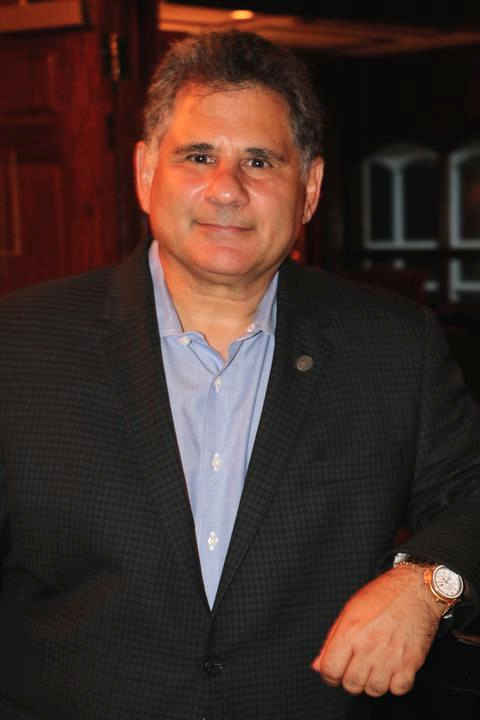 Here's more from Furniture World's point/counterpoint duo Bill Napier and Ed Tashjian. This is their sixth installment, having previously debated celebrity licensing, digital advertising overload, the millennial myth, whether or not furniture brands matter, the future of furniture markets and the future of independent reps.
Are people entering the furniture industry better served earning a college or a vocational degree? Is the current state of our educational system a problem for our industry? it. But, besides food and shelter there’s nothing more nurturing than an education. My colleague Bill Napier will argue that the $1.5T in student debt is reckless, irresponsible and that most Americans would be far better served in earning a vocational degree. He will cite statistics that about 44 million graduates hold student debt, and today’s graduates leave school holding promissory notes worth an average of $37,000. He will tell you that student debt has more than tripled since 2004, reaching $1.52 trillion— second only to mortgage debt in the U.S. College costs have outpaced the Consumer Price Index more than four-fold since 1985 and that college debt delays buying a house, getting married, having children and saving for retirement. And all of this is true. The question we are debating is whether people entering the furniture industry are better served earning a college degree or a vocational degree. highly impractical—such as sports or a marketing, art history or women’s studies. The argument is that you would be better off to learn a trade like plumbing, welding or even upholstery. I will tell you from experience that every decent college professor cares deeply and is often at odds with administrators. I will also tell you that it is not the major, but rather the student that determines the value of the education. Students that are not ready for higher education, should take a gap year and find themselves. But everyone deserves the chance to get an education, and our country does depend on having an educated electorate. never crossed my mind. I don’t think I’m unusual. The importance of a liberal arts education is about the pursuit of knowledge for its own sake. It teaches critical thinking, communication (reading, writing and making a presentation), problem-solving, self-expression— and most important of all, a love of lifelong learning. It allows you to explore your interests, learn different points of view and be exposed to people who come from different places and have had different experiences. all is for their kids to be happy. And you can't be truly happy without doing something for which you have a passion, and some talent, that the world needs, and is willing to pay you to do. to be sensible about the debt they incur. I will be the first to proclaim that there are many glorified loan sharks disguised as purveyors of higher education that do not have students' best interests at heart. But that should not discourage anyone from getting an education. For entry level jobs, I would always rather hire a curious and educated generalist than a specialist. anything of practical use. 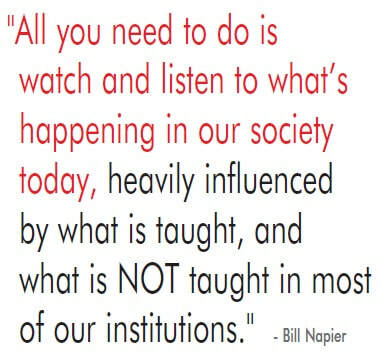 What they have learned or believe they know is mostly wrong and needs to be relearned. It is incumbent on any company in our business to take on the job training and continuing education seriously. inefficiencies. All this will change in the next decade with flat pack upholstery that will make the cube to value ratio similar to casegoods. and that you learned how to use a handloom at a vocational school or as an apprentice. Most likely, the industrial revolution was a bad time for you because machines were introduced that could do your job better, faster and cheaper. Any American who built casegoods at the turn of the 20th century saw history repeat itself. This leads me to a second anecdote: It's an urban legend about the etymology of the word sabotage, which ironically is closely related. Sabot is the French word for shoe, which in those days were wooden. The story goes that when management wasn’t looking, the artisans would stick their sturdy wooden shoes, lodging them in the delicate wooden cogs of the weaving machines, which would cause the spines of the cogs to break, and the artisan bought a few more weeks of work until they could be replaced. ​But in the end, the machines and the educated engineers who build them always win, just as surely as the American folk hero John Henry “the steel driving man” was beaten by the steam powered machine. are a tremendous value. But the best value of all is the Internet, which is practically free. Our current education system is flawed, based on an antiquated rhythm centered around the agricultural farming calendar. The reason we have a summer vacation is so that the boys could come home to work the fields. But that is no reason to throw out the baby with the bathwater. In our pockets we hold a smartphone which is more powerful than computers that put a man on the moon 50 years ago. Mobile access democratizes knowledge so that someone living in a hut in Haiti has incredible access to knowledge. ​Between Siri and Alexa we don't even need to go to the trouble of typing in a search query. In the end, the best teachers teach us how to teach ourselves. But it all depends on a student's level of curiosity. He or she can use internet access to learn the wisdom of ancient minds, or post pictures of their cat. foreign investment and subsidies, currency fixing, and superior supply chain logistics killed them. No matter how strong a brand is, it cannot make up for something that is nearly as good for 40% less. You wouldn’t learn that from studying STEM, or from being part of the historic furniture manufacturing culture. You learn that from common sense and critical thinking. computer software design and a minor in hardware design. She’s an executive in Silicon Valley. The journey was VERY expensive and as of three months ago, paid for in full. ​But to Ed’s point, let’s look back to the book: The Furniture Wars and how America lost a 50 billion dollar industry, written by Michael Dugan in 2009. I wrote about this incredible case study in March 2017 on my marketing website, www.social4retail.com and much of what I RANTED about, still holds true. Safe spaces – OMG what is that? Our educational system is failing everyone. 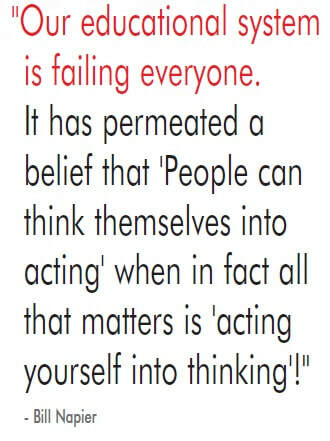 It has permeated a belief that “People can think themselves into acting” when in fact, all that matters is “acting yourself into thinking!" A degree in “feelings” delivers no economic impact or value, except maybe to the person that spent tens of thousands for that degree. In Dugan’s book, he relates how industry outsiders thought they could take over the industry, grow it with marketing, without any knowledge or experience as to how furniture was designed, manufactured and delivered. They chose to ignore STEM-based educational platforms that drive the basics of our industry. They failed miserably because they diverted financial and intellectual resources to the emotions of marketing instead of making investments in manufacturing and technology. And, it is interesting that even today our industry doesn't invest in manufacturing and technology. Instead, most outsource their furnishings products from Asia. Why? Because they have invested in STEM! Is the U.S. Lagging Behind? Research shows that the U.S. has 12.75 million manufacturing jobs, according to the Bureau of Labor Statistics, employing approximately 8.5 percent of the workforce. Manufacturing jobs pay an average of 12 percent more than all other jobs. In 2017, the average was $84,832 per worker, including benefits. That's $40.79 per hour. That’s roughly 27 percent more than average workers, who earned $66,847 annually. Yet, 89 percent of manufacturers are leaving jobs unfilled. They can't find qualified applicants, according to a 2018 Deloitte Institute report. The skills gap could leave 2.4 million vacant positions between 2018 and 2028. That could cost the industry $454 billion in 2028. What Ed neglected to state is that of the $1.5 trillion of debt, much of this is in either default, over 90 days, in forbearance, deferment or in a grace period, before it enters negative collection territory. Loans in deferment: $124.3 billion, 3.7 million borrowers. Loans in forbearance: $111.1 billion, 2.6 million borrowers. Loans in default: $101.4 billion, 5.1 million borrowers. Loans in grace period: $43.9 billion, 1.7 million borrowers. Additionally, let’s look at where we stand educationally, worldwide. The latest findings from the Pew Research Center have the U.S. in 38th place out of 71 countries when it comes to math scores and 24th place when it comes to science. AND the cost for a college degree has grown. OUCH! This is because our educational system is failing, failing to teach the basics of reading, writing, science and math. Those four basic elements make our world go around. The average tuition and fees at private national universities have jumped 168 percent. Out-of-state tuition and fees at public national universities have risen 200 percent. In-state tuition and fees at public national universities have grown the most, increasing 243 percent. And for what? Because it’s easy to get free money/loans, but it’s not so easy to pay them back if a degree doesn’t result in a sufficient salary to service the debt (I mean "investment"). Information Technology (IT) workers have been estimated to earn 74 percent more than the average worker. The share of American young adults living with their parents is the highest in 75 years. systems, and especially the high cost of getting an education. 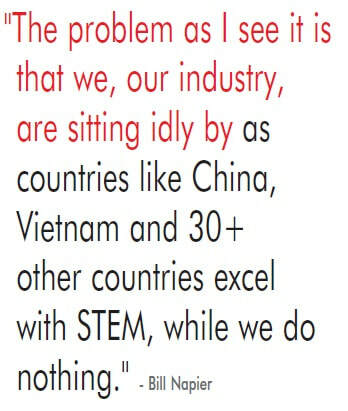 The problem as I see it is that the U.S. furnishings industry sits idly by as we watch countries like China, Vietnam and 30+ other countries excel with STEM, while we do nothing. That is except for one company I know of, Ashley Furniture Industries, Inc.
Ashley, being the world’s largest furniture manufacturer knows that STEM is critical to its success today and even more for its future. 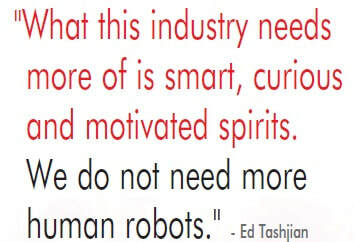 They constantly invest in new technologies, machinery, robotics and more. Ashley knows that their investments in the U.S. will require skilled operators and managers, and they’re doing something about it, as you should you as a manufacturer or retailer. explore, get school credit for their learning experiences, and find out about career opportunities with STEM. continues to advance and the global economy evolves, training and educating the current and future U.S. workforce will be a crucial part of our country’s success. respected or considered. That concerns me. 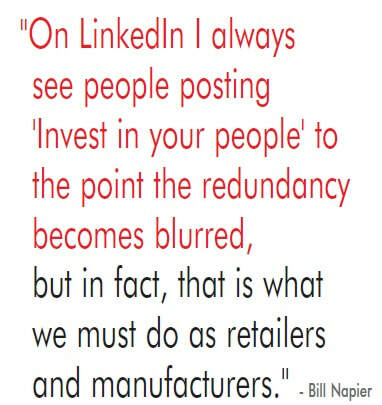 On LinkedIn I continually see posts about “Investing in your people” to the point of extreme redundancy, but in fact, that is exactly what we must do as retailers and manufacturers. Ashley invests over $20 million per year in continuous improvement, and that’s a statement on how and why they are and will remain the largest furniture company in the world. ​Retailers and brands should take a close look at what Ashley does, both internally and in the communities where they do business. They invest in their people with tuition reimbursements and scholarship programs for their employees children. They send their leaders into communities to speak on issues relevant to STEM education, and so much more. Ashley innovates and never gets comfortable with the status-quo that has become the norm for many manufacturers and retailers. They focus on continuous improvement in people, processes, community, technology, and education. Every company could use this model to attract, retain employees and improve their business today and into the future. The alternative is to ignore these types of commitments and quickly become irrelevant like many of the iconic brands and retailers that are extinct today. If you can't figure that out, call or email meand I'll enlighten you further. 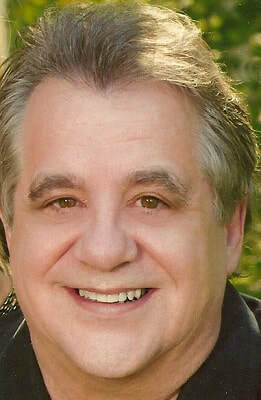 ​Tashjian Marketing provides senior marketing leadership to the Home Furnishings Industry. It specializes in business analytics and in helping its clients to segment the market, define and communicate a sustainable differentiated value proposition. Get more information at www.Tashjianmarketing.com or call (828) 855-0100. ​See all of Bill and Ed's commentaries at https://www.furninfo. com/Authors/List.